At a meter long, the one-piece Marvel keyhole sink offers prep sink features with Euro sizing. Ideal for specialty uses, the Marvel keyhole sink has an odd look and configuration coupled with many practical features. I’ve sometimes seen this sink style in European kitchens where space is tight and the 39-3/8″ length supports that — the sink is a meter long. Designed to be under mounted, the circular bowl end is 20-inches in diameter. This is one of two models I photographed at a home show. It’s tricked out and very practical since it has a recessed groove all around that supports a half-moon-shape cutting board that leaves some of the 8-inch deep sink bowl accessible. Plus there’s a stainless steel trivet that fits over the integral drainboard. 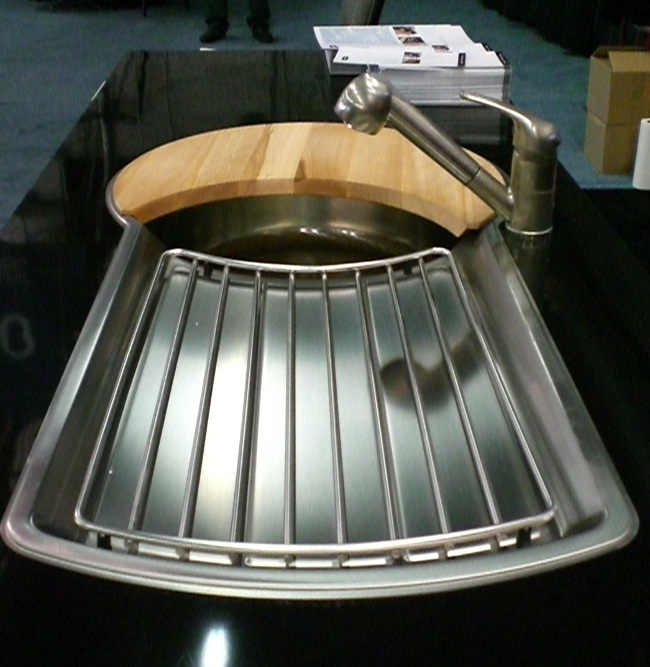 Marketed as an “entertainment sink,” which is meaningless, the keyhole is prep sink size and a case can be made for using it without the trivet as well. It would be practical on a large island, in a wet bar and be efficient in an outdoor kitchen as well. I’d want a small-scale pull down sprayer faucet for this sink though the manufacturer shows it with a low pull out. An end-to-end view shows the practical configuration. 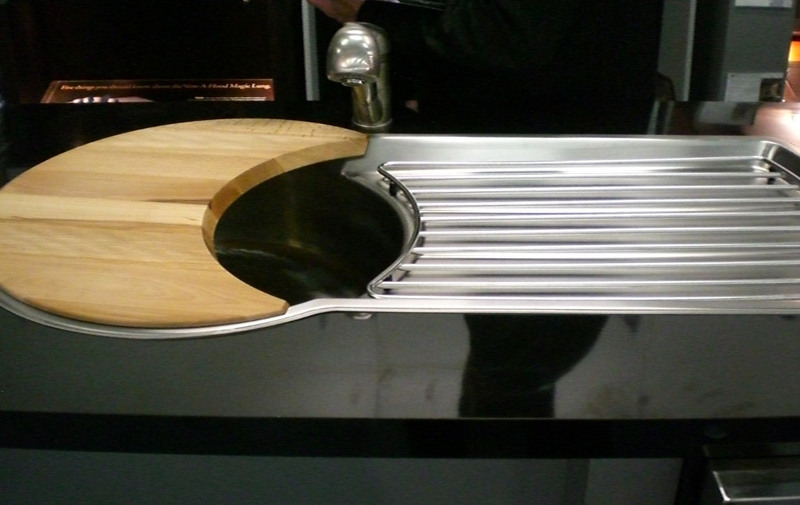 There is another version of the sink with a narrow second compartment, suitable for a garbage disposal, in the center. That cuts into the practicality of the drainboard for me but it’s an option that someone might want. Marvel is the parent company of Aga ranges and has long been established in Europe.